Tag Archives: joe mcginniss jr.
CAROUSEL COURT by Joe McGinniss, Jr.
Carousel Court is one amazingly bleak book. The novel, by Joe McGinniss Jr., is about a couple – Phoebe and Nick – who move from Boston to Southern California in search of a better life. In Boston, Phoebe was a pharmaceutical sales rep and Nick a documentary filmmaker. They lived in a cramped apartment with their toddler, Jackson. Lured by the promise of sunny weather, an easier pace of life, and the untold riches that would come from flipping a suburban LA house, they make plans to leave it all and head west. Just before they are scheduled to leave, Nick learns that the job he has been promised in California has fallen through. So by the time they arrive in LA, they are already stressed and under the gun. LA is nothing like what they hoped it would be. The real estate crash has left the economy decimated, with no jobs and suburbs full of empty, bank-owned houses. Phoebe, who had hoped to take a few months off to be with Jackson, just resumes her pharma job on the west coast. Nick, unemployed and increasingly desperate, takes on work cleaning out abandoned houses so that the banks can take them over. He works during the night, filling dumpsters with furniture and trying to avoid roving bands of pillagers who break into empty homes and pillage them during those same dark hours. Bleak, huh? Well, the real bleakness of Carousel Court comes from Phoebe and Nick themselves. Phoebe, furious at her husband for his failure to provide for them, increasingly relies on anti-anxiety meds, sleeping pills and alcohol to get her through her long days of driving on LA freeways, calling on doctors’ offices to push her company’s medicine. She belittles her husband and carries on a sexually charged long distance text relationship with her former boss (and flame), a finance guy in Boston who toys with her, promising to swoop in and save her with a new job, a new house. Relations between Nick and Phoebe grow increasingly more hostile as he suspects her affair and has to compensate for her inability to parent Jackson or be supportive in any way. The stress level of the book is ratcheted even higher by the constant threat of violence that surrounds this fractured family – from looters, from coyotes, from wildfires, from the next door neighbor who is staked in a tent with a gun on his front lawn all night long. Plus there’s the fact that both Phoebe and Nick are both pretty hateful people. And all of the bleakness. Is. Unrelenting. It’s not cyclical, because it never ebbs. It just flows, constantly. If you want to learn more about the real estate crisis, watch The Big Short, which is just as illuminating but more enjoyable. Carousel Court was too long, too bleak, too tense. 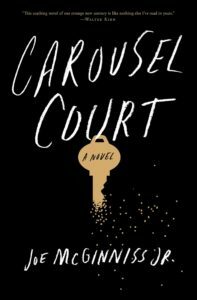 I listened to Carousel Court on audio, and I would get out of my car in the morning in a tense, unfulfilled mood because of the book. The narrators were fine – Joy Osmanski and Corey Brill – but they did not offset the bleakness of this book. In fact, like the book, they were sort of relentless – relaying the parade of horribleness with a staccato precision that made the experience even less relaxing.